4405 Double Sided Tape is manufactured from PVC film coated on both sides with a rubber based adhesive. It is supplied with a cream coloured siliconised paper liner. 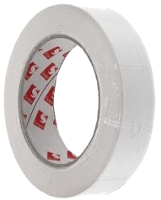 4405 is a general purpose splicing tape suitable for virtually all substrates with the exception of siliconised paper. It is also widely used in such print finishing applications such as showcard assembly and mounting dummy packs and samples on display and sample cards. Good balanced adhesive system providing good bond strength during actual application but when required clean removability.